When you look at a satellite image, you are not thinking about reflectance, solar radiation or any other atmospheric disturbance, and you shouldn’t need to. You need to be able to use Earth Observation data and be sure the data you want to use is of the highest possible quality. However, we still need to take into account that, in land surface research the view on the surface can be substantially ‘blurred’ by atmospheric constituents, such as aerosols, dust, smoke particles, and air molecules. Therefore an accurate atmospheric correction is essential to derive accurate surface reflectance and vegetation information and their changes over multiple decades. Let me tell you a few things you can keep in mind to obtain the proper data for the application you need. Aerosols play an important role in the Earth’s energy balance. In the absence of clouds, the reflectance measured by a satellite consists of surface and atmosphere contributions (see Figure 1 for a conceptual plot of the scattering and absorption processes in the Earth’s atmosphere). Because aerosols contribute most to the atmospheric scattering and absorption in the visible and near-infrared, obtaining accurate Aerosol Optical Thickness (AOT) information, a measure for the atmosphere’s opaqueness due to aerosols, is very important in the atmospheric correction to yield accurate surface reflectance information. 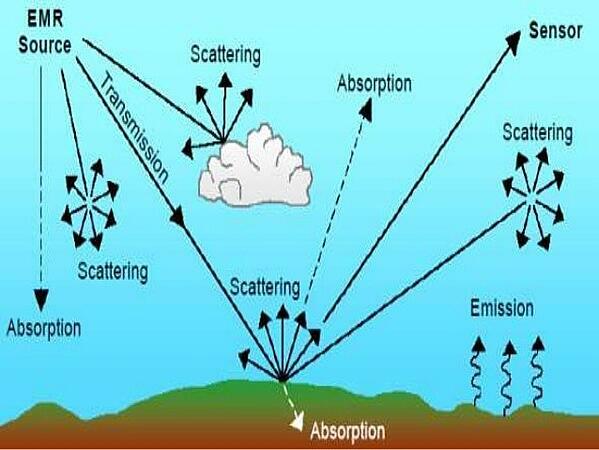 Conceptual plot of atmospheric scattering and absorption in the Earth’s atmosphere. Until now, Aerosol Optical Thickness (AOT) information over vegetated areas is retrieved from the PROBA-V BLUE and SWIR channel reflectances (Maisongrande et al., 2001) and used as input for the Simplified Model for Atmospheric Correction (SMAC, Rahman and Dedieu, 1994) algorithm. However, comparisons with ground based AOT observations revealed a considerable mismatch. We therefore developed an atmospheric correction model for PROBA-V data, in which we focused on the usage of more accurate AOT retrievals and the application of a more accurate atmospheric correction algorithm. We investigated the usage of the Combined Inversion of Surface and Aerosols (CISAR), a state-of-the-art method to simultaneously estimate AOT and surface reflectance. CISAR has already been used on geostationary Meteosat satellite observations and requires multiple cloud-free observations with sufficient spectral resolution to accurately characterise the surface reflectance. to investigate whether the retrieved surface reflectance from CISAR could improve on the currently used operational atmospheric correction for PROBA-V.
We can show that the CISAR algorithm is well able to improve the current atmospheric correction (see the figure below). Comparisons with AERONET and MODIS data revealed that both the AOT estimates and surface reflectance estimates are of high accuracy, which is needed for improved surface reflectance information. To achieve an operational service reflectance product using CISAR, additional research is required to enable processing of entire images and to improve the processing speed. 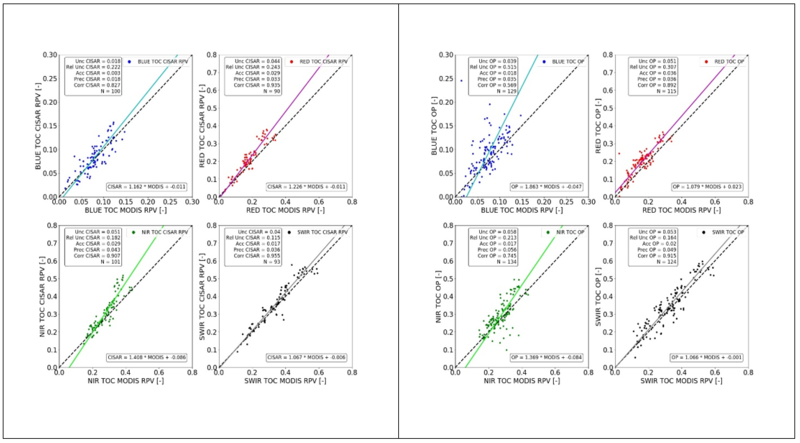 CISAR versus MODIS surface reflectances (left 4 panels) and current operational surface reflectances (denoted OP) versus MODIS surface reflectances (right 4 panels). The dashed black line indicates the 1:1 relation, solid lines denote the least squares regression. In 2016, NASA and ESA invited researchers to participate in the Atmospheric Correction Intercomparison Exercise (ACIX), a study to investigate the differences between various atmospheric correction methods. During this study we assessed the accuracy of our in-house iCOR algorithm. After application to Landsat 8 and Sentinel 2A data, the intercomparison showed that iCOR is well suited to retrieve accurate AOT and surface reflectance information. The ACIX results were recently published, the paper can be viewed here. Within the framework of the Terrascope platform, iCOR is already operationally applied for the atmospheric correction of Sentinel-2 imagery. Additional to the potential improvements to retrieve AOT information from the image data, we investigate the usage of accurate auxiliary AOT data in case no retrieval is possible. The Copernicus Atmosphere Monitoring Service (CAMS), provides AOT data that comprise a combination of sophisticated atmospheric composition modelling and assimilation of various satellite-based AOT retrievals. Developing multiple image processing services for various applications and end-users, we continuously put efforts to further improve and harmonise the radiometry and atmospheric correction for various sensors. These efforts aim at seamlessly adding satellite time series from the early NOAA-AVHRR satellites through the recently launched Sentinel-3 satellites, and we thereby generate a harmonised surface reflectance dataset that will finally span multiple decades. Stay tuned for more news as we will continue our research studies in radiometric harmonisation of these long term multi-sensor datasets (Landsat-8, PROBA-V, Deimos-1, and Sentinel-2).